The language used by Taiichi Ohno to guide the development of the Toyota production system (TPS), and in his later descriptions of TPS (in Japanese), was precise (read Jun Nakamouro’s excellent article). In kaizen with sensei Chihiro Nakao, who was mentored and trained by Ohno-san, Nakao-san guides people on the precise use of language. He views this as a very important component of kaizen because understanding is impaired and improvement is wrong, poor, or delayed when language is imprecise. Having written books in collaboration with Nakao-san about his teachings and Shingijutsu-Kaizen, and can tell you from experience the great importance he places on precise language. Yet, when we exit TPS and enter the world of Lean, the use of precise language – as well as its importance – begins to falter. It falters ways that significantly affect our understanding and practice, and hence the human outcomes and business results that are achieved. Material and information flow diagrams became “value stream maps.” Kaizen became “continuous improvement,” with a major loss of context. And our understanding of “work” and “waste” are also imprecise. Most think the word “people” in “Respect for People” means employees, when it actually means employees, suppliers, customers, investors, and communities, possibly other stakeholders, and humanity. Another example is the title and role of people who train others in Lean. Are they teachers (sensei), trainers, or coaches? Are they faculty? Who uses the term faculty? 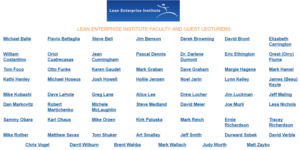 For almost two decades, the Lean Enterprise Institute (LEI) and the Lean Enterprise Academy (LEA) have referred to their trainers as “faculty” (and recently added “Guest Lecturers”). That is an odd description. I know of no other organization that uses the term “faculty” for people who deliver training to industry (and who are mainly consultants). The commonly accepted definition of faculty is “the teaching and administrative staff and those members of the administration having academic rank in an educational institution” (Merriam-Webster). While both LEI and LEA are not-for-profits, neither organization is structured as an educational institution (click here to read the U.S. government definition of an institution of higher education), nor do they confer academic rank. 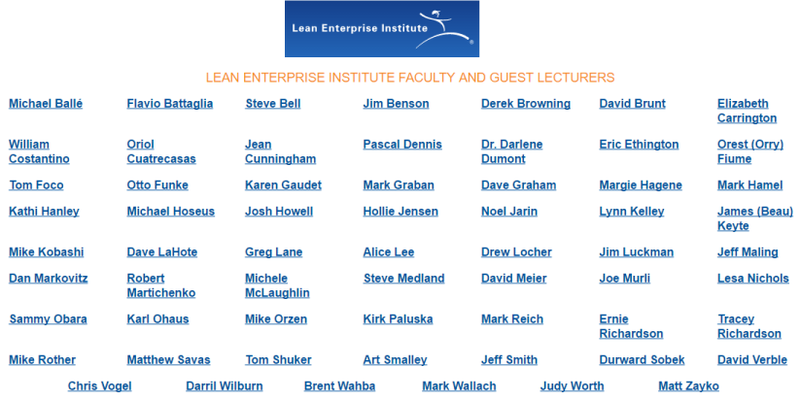 In relation to the common usage of the term “faculty” in education, its use by the Lean Enterprise Institute and the Lean Enterprise Academy is surely misleading to its customers. It is pretentious and it carries with it a huge sense of arrogance and puffery, behaviors that are the exact opposite of what we learn from Toyota leaders (e.g. humility) – yet another language imprecision. Do LEI and LEA trainers correct the many language and other imprecisions associated with Lean management? Or do they perpetuate the imprecisions? If it is the latter – and it surely is – then they are not “faculty” in any sense of the word. They are, instead, a collection of regular businesspeople (employees, freelancers, and small business owners) hired to do a training job but, apparently, not improve the job if one must adhere to Lean orthodoxy. “Companies make a big mistake in implementing the Toyota production system thinking that it is just a production method. The Toyota production method won’t work unless it is used as an overall management system… those who decide to implement the Toyota production system must be fully committed. If you try to adopt only the ‘good parts’, you’ll fail.” (T. Ohno in NPS: New Production System, I. Shinohara, Productivity Press, Cambridge, MA, 1988, pp. 153 and 155). No similar warnings exist for Lean. Why not? Certainly this warning applies to Lean management if it is indeed actually the same as Toyota management. Womack and Jones have yet to issue such practical warnings. The basis for criticism of Lean is its many imprecisions as a derivative of TPS. Click image to enlarge. You can see that imprecise language and other forms of imprecision are not bugs in Lean. Instead, they have been features for 30 years. My motivation for questioning and criticizing Lean, LEI, LEA, and the work of its founders is related to my role as an actual faculty member whose job it is to seek the truth. The aim of scholarly criticism is to study, evaluate, interpret, and question a subject area or body of knowledge such as Lean, for the overarching purpose of advancing (improving) our understanding and practice. My work over the last 20 years has focused on questioning the Lean = Toyota equation, which most people easily accept as true, without ever thinking, simply because someone told them it was so. 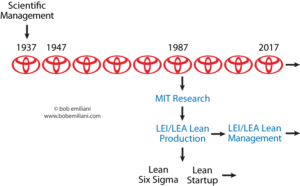 In reality, Lean ≠ Toyota because Lean is imprecise because it is missing major elements of Toyota’s production system, The Toyota Way, and more. I have focused on filling gaps such as: Absence of the “Respect for People” principle (Fake Lean), Lean leadership, Lean as a management system, and analysis of Lean transformation process failures (both mindset and methods). Management fucks with people’s lives. Management affects people economically, socially, politically, physically, and mentally. Management is a serious and sometimes life-and-death matter. Management practice is no joke, so it is important to get it right. As a member of the Lean community, I feel a great responsibility to do my part to help assure that imprecise language and imprecise derivatives of TPS do not cause harm to people (stakeholders such as employees, suppliers, customers, investors, and communities) – especially employees, who we know have suffered greatly from manager’s misunderstanding and misapplication of Lean over the last 30 years. In other words, I feel a responsibility to respect people. Obviously, not everyone feels that way. I am a full-time teacher. That means I work in one of the humble “helping” professions. So my purpose is to help people through teaching and learning, with precision, so that they can prosper. Criticism, rooted in my scholarly writing, is one method by which I fulfill this important responsibility. How about you? benefit in terms of better satisfaction,better profit and better work environment. 2. Overconfidence while doing Kaizen in New Genba: Many times Kaizen men fail thinking that they have done so many Kaizen in past . Just do it in my way without involving the Genba staff and explaining /showing the purpose and benefit . for long planning without doing. Once we start we need to check the progress not the result quickly and adjust the countermeasure. 6.Do not Rely on tools to give magic: Tools definitely give a better edge but some time it acts like cutting your leg to fit in to shoes. So try as much as possible manual tool before making computer based system to have flexibility. Yes, that seems to be the situation in the US. 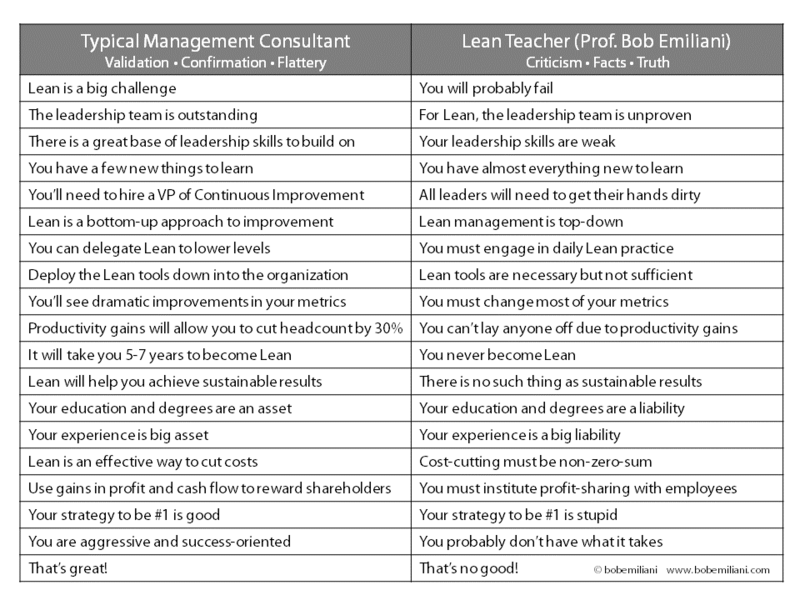 Worldwide there have been gurus, consultants and organisations that have worked in a non-lean way earlier on. 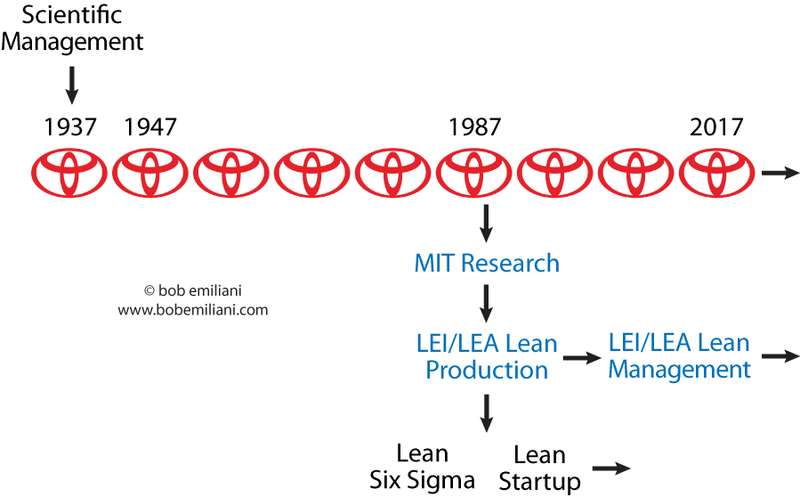 They have recognised that Lean does not equal Toyota, and that Lean is a subset. An example of this is Edwards Deming and work he inspired worldwide.